I am always trying different flavor combinations. It is part of how I develop my recipes. Of course, there have been some failures, but often I come across a delicious new taste. Part of this recipe started as out as a sauce. I loved it so much that I started adding its ingredients to everything I made. These delicious caramelized onion and pear tartelettes are the end result of a couple of very high calorie, but very satisfying weeks of recipe development. The flavor and texture of these tartelettes can’t be beat and your house will be filled with their amazing smell. This recipe will feed twelve to eighteen people, but to be honest, it’s hard not to eat more. They are just that hard to resist. You can prep these tartelettes ahead of time. Caramelize the onion and pears and make up the cheese mixture and refrigerate for up to three days. Just make sure to bring the ingredients up to room temperature before adding them to the puff pastry to bake. 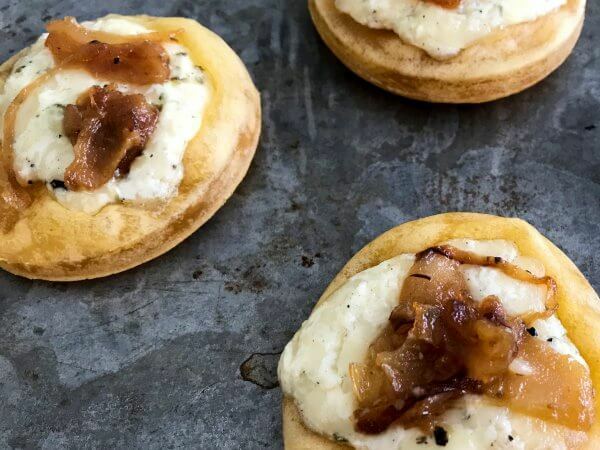 In addition to being delicious, these bite size onion and pear tartelettes are beautiful and would be a perfect addition to any appetizer table. If your puff pastry is still frozen, set it on the counter top for about 30 minutes. Once defrosted, refrigerate the puff pastry until needed. Peel and thinly slice onions and pears. Add onions and pears to the melted butter. Turn the heat up to high. Stir continuously for five minutes. Then add water and carefully scrape bottom of the pan to release any browned bits that have stuck. Reduce heat to medium and stir occasionally. Allow the pears and onions to caramelize until the are golden to dark brown, about 10 minutes. Stir in dried thyme. Remove from heat and set aside. Grate Swiss or Havarti cheese. In a bowl, combine the grated cheese with the room temperature cream cheese. Mix until well combined. Plastic glove covered hands are the best tool for this job. Add dried mustard, oregano and black pepper to the cheese and mix until well combined. Again, plastic covered gloves work best here. Measure out 1 teaspoon of cheese mix and flatten into coin shaped discs about the size of a quarter. When finished, you will have about 48 discs. Work with only one section of puff pastry at a time. You want the pastry to be cold when it goes into the oven. Gently roll out the pastry until even. Do not press down hard or the pastry will not puff correctly. Cut out each puff pastry sheet into 12 even squares or 2" circles. Place cut pastry onto a parchment paper or silicone sheet covered baking sheet. If using parchment paper, make sure that your paper is rated to 400°. Bake the plain pastry until it is puffed and light golden brown, about 7-8 minutes. Reduce heat to 375°. Remove baking sheet from the oven and carefully place a cheese circle in the center of each pastry and then top with 1/2 teaspoon of the onion pear mix. Return baking sheets to the oven and bake until the pastry is golden brown and the cheese has melted, about 3-5 minutes. This Caramelized Onion and Pear Tartlettes recipe is vegetarian and gluten free with pastry substitution.